20 years of research from East Finnish University showed, that men who visited sauna 4 to 7 times a week, had 66 percent less dementia syndromes. 2000 middle aged men participated in this research focused on the impact of using sauna to Alzheimer and other dementia diseases. The participants were divided in to three groups, where the first one visited sauna once a week, the second group 2-3 times per week and third one 4 to 7 times in a week. The more sauna was visited the less became the risks of dementia diseases. Similar researches have discovered the positive impact on decrease of heart diseases for those who are using sauna. Professor Jari Laukkanen who was leading the last research on correlation between sauna visits and dementia, said that the mechanisms influencing the heart and memory have to be further researched. However it is known that the function of heart and cardiovascular system has a direct impact on the brain health. Sauna stimulates our body in various ways, including the refreshment trough the changes of cold and hot environment, and the massage through brushing with the birch branches. The best sauna for our body system has the heat of 70-100 degrees Celsius and the humidity around 30%. If the sauna is too hot or too humid, it prevents us from sweating. 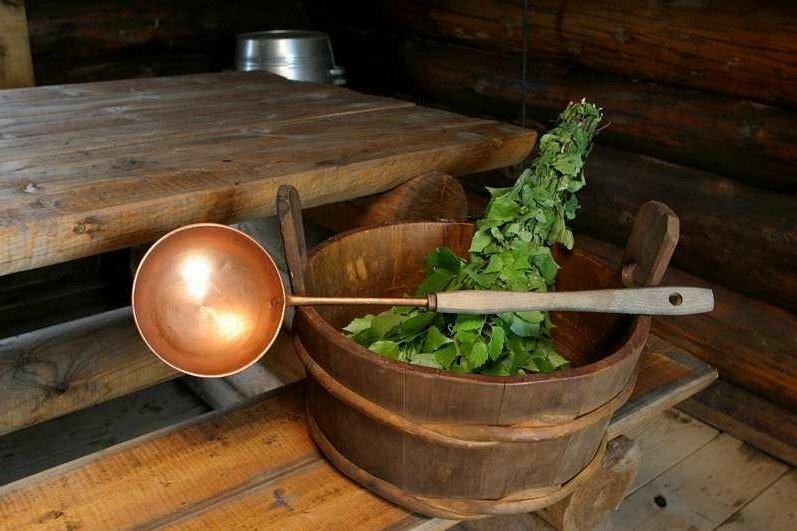 Finnish sauna with wood infused steam and massage with young birch tree branches has a positive impact on our nervous system, muscles, skin, heart, cardiovascular system, digestion etc.. In some cases, i.e. high blood pressure, tuberculosis, heart diseases, otitis etc, it is not recommended to use in sauna the birch branches massage. However by many diseases such like chronic arthritis, arthrosis, muscle ache and neuralgia, overweight etc, the sauna and the massage in the sauna can contribute to the recovering process. By coming to sauna it is not recommended to go directly to the hot steam room. Our skin is dirty and hot air is opening the pores, therefore it is necessary to shower first. It is not necessary to wash your head in this stage. The hot shower helps our body as well to warm up. After that you can go to the hot steam room by covering your head with a towel or special sauna-hat. If you are not used to sauna, then it is recommended to stay on the lower steps of the steam room. If your body has adjusted to the heat, you can start throwing water on the hot stones of the steam room. It is necessary to use hot water as cold water will chill down the sauna as well the stones may break. A genuine steam shall have an even heat. By throwing the hot water on the sauna stones you have to be careful not to make the sauna too hot, as it takes a little time until the heat is reaching all areas of the room. If you are not alone in the steam room, it is a good custom to ask permission from others before throwing the water as not everyone is used to very hot sauna. By using the birch branches, it is good first to start slowly by brushing the body with the branches and after slap a little harder. It is recommended to start with the movements from tows and move towards your heart and head, similar at it is done by a massage. It is not recommended to slap with the birch branches your head and neck. After the steam room you shall cool down by using a cold shower. If you do not have any health problems, you can as well jump in to the cold water or snow, however it shall be done with feet first so that your cardiovascular system can adjust to the rapid change of the temperature. By jumping in to the cold water with head first, there may be serious health risks as well you can faint. You can repeat the using of steam room and the massage with the birch branches. At the end it is recommended to wash your body thoroughly. Before dressing you shall properly cool down as the sweating usually continues for some time. Drinking fresh water or herbal teas helps your body to cool down faster. It is not recommended to drink hard liquor before, during and after the sauna, as it increases too much the blood pressure as well has an additional impact of dehydrating the body. Moderate consumption of light beer after a good sauna is part of a tradition.